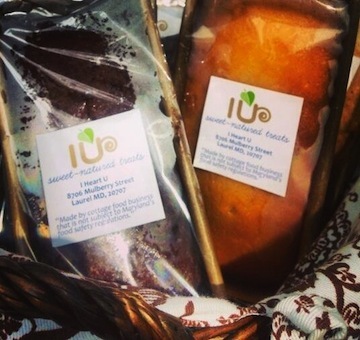 I Heart U | Gluten Free D.C.
What I got: Goin’ Gorillas banana bread with dates. This delicious goodie did not last long in my house. Bonus points for being nut-free! Gluten-free friendliness: All of their desserts are organic, gluten-free, vegan, non-GMO and scrumptious. Whether you’re in need of comfort food (chocolate cake) or craving an international flavor (baklava), I Heart U has it covered. 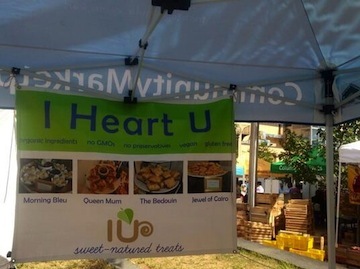 Overall vibe: I Heart U is a refreshing find amongst the traditional bakeries found at local farmer’s markets. There was a variety of cakes and bread loaves to choose from when I stopped by their tent at the Columbia Heights farmer’s market. Their stand is not to be missed! This entry was posted in Mobile and tagged Bakery, CommunityMarket, Dessert, FarmersMarkets, GFDC, GlutenFreeBakery, GlutenFreeDC, GlutenFreeFoods, IHeartU, WashingtonDC. Bookmark the permalink.